88 MMS October 2017 mmsonline.com FEATURE spindle hand-off. For example, why not engage head- and turret-mounted tools in the workpiece simultaneously? 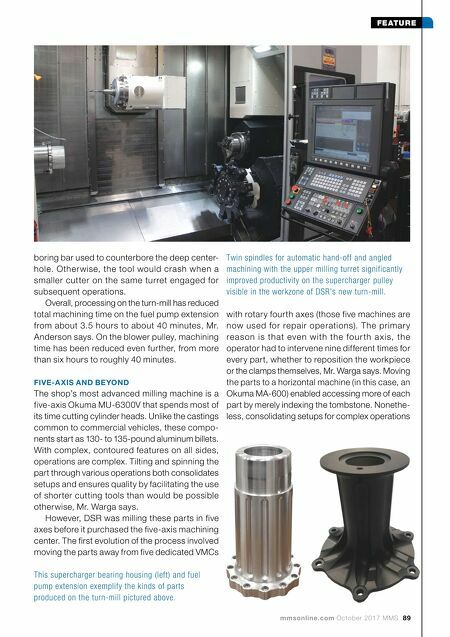 How might operations be stream- lined, or part quality improved, by tilting the mill- ing head for angled machining? DSR has done both on other supercharger components. On the bearing housing, for instance, pinch-turning halved roughing time. On blower pullies, one of which is visible in the spindle of the turn-mill on the next page, tilting a ballnose cutter at 45 degrees helps make the most of the 3 / 16 -inch-diameter ballnose tool's cutting edge. This has enabled cutting the scallops lining the part's outer diameter in two 0.0725-inch passes, plus a 0.005-inch finish pass per scallop, rather than 10 passes at a cutting depth of only 0.015 inch. In fact, Mr. Warga says initial roughing and single-point-tool finishing of all scallops on a typical part now takes only about 30 minutes, compared to about 3.5 hours before. The new machine has also reduced the need to interrupt the process for manual cutting tool swap-outs. For fuel pump extension component pictured on the next page, that's not just because the new machine holds more cutters than the old lathe's 12-station turret. Whereas the Multus's ATC keeps tools out of the more spacious work- zone when not in use, the previous machine required repeatedly removing and remounting the These workpieces represent various stages of machining connecting rods from rectangular billets on HMCs. Beyond greater efficiency, this approach simplifies fix- turing. It also eliminates the sawing operation that once separated single- piece forgings into caps and bodies. Arranged for demonstration purposes, this setup demon- strates the various gripping positions and hydraulic fixtures (supplied by Busche Workhold- ing) required for machining connecting-rod bodies. A cap is visible on the left side of the tombstone, which has different fixtures on different faces. Some operations require flip- ping the part within the same fixture, while some require a separate fixture. Setup for each operation is easier and faster than on the VMCs, and it can be performed without stopping the spindle.